PDFs (Adobe). While printing directly form the eTextbook is available in the Thuze Web reader, PDFs are optimized for printing and can be used on other reading devices (Kindle, Nook, iBooks). With a PDF on your computer you do not need to be connected to the internet to review or study your materials, you can simply open it from your computer. MP3 Audio. This option is great for on-the-go learners; commuters can listen in their car/personal device (anywhere MP3 is suported). You can select PDF or Audio when purchasing an eTextbook from the Thuze Bookstore. If choosen, upon payment confirmation the materials can be accessed and downloaded by clicking on the Download icon in the upper right hand corner of the Thuze Web Reader. Once selected, a drop-down menu will appear. To download, simply select the "download" link next to the course content. Save the file to your local computer. NOTE: If the PDF and/or Audio version was not purchased alongside the eTextbook from the Thuze Bookstore, to purchase and access the materials, click the Download icon in the upper right hand corner of the Thuze Web Reader and click "Buy Now" next to the file type you wish to acquire. You will be re-directed to the Thuze Bookstore where the materials can be purchased. Upon payment confirmation, the materials can be accessed and downloaded from the Thuze Web Reader. Thuze has a print feature built into the platform that allows to print on-demand, a single section or multiple sections, one chapter or all of them; it's up to you. You can also create a study guide by printing out your notes and highlights. From the Thuze Web Reader, select the Printer Icon in the upper right hand corner of the reader. Check the box for each section you wish to print. 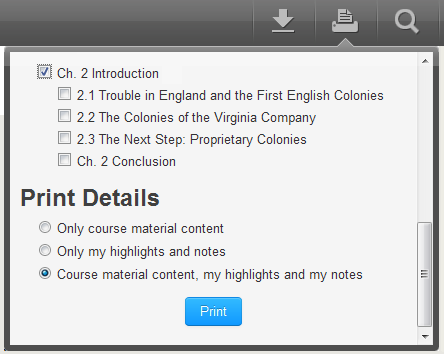 Under Print Details, select if you want to print only course material content, only your highlights and notes, or both course material content and your highlights and notes. How can I recover my materials if my computer crashes? Can I transfer my materials from one computer to another? As the Instructor, what supplemental materials are available for my eTextbook? Are there PowerPoint Presentations to go with the eTextbook? Am I able to load eBooks from other sources onto my Thuze reader? Can I download the books on a 3G connection? Why can't I print from my iPad or Android device? Can I download the book in other formats from the iPad and Android apps?